The ‘The Domesday Monachorum’ is an ancient book in the archives of Canterbury Cathedral. It was compiled on the orders of Archbishop Lanfranc when he came into office in 1070. This book contains a list of churches which paid a ‘Chrisom Fee’ to their diocesan bishop for the ‘consecrated oil’ he supplied for use during Christenings. Christening had to take place in the church of the parish in which one was born - even today you need your parish priest's permission to be baptised elsewhere - and the size of the fee reflected the value of the parish. 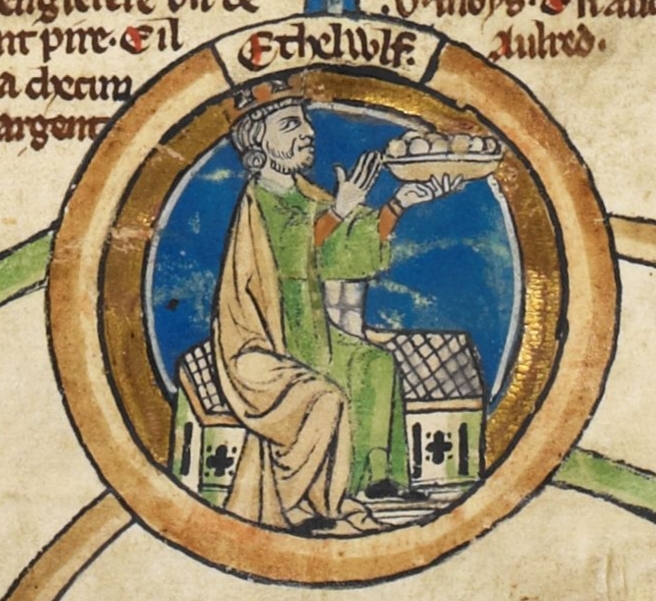 In 1085, the income of the Manor of Chelsfield was some twenty times larger than that of the Manor of Farnborough, so Arnulf would have made his headquarters at Chelsfield with his Priest residing there. 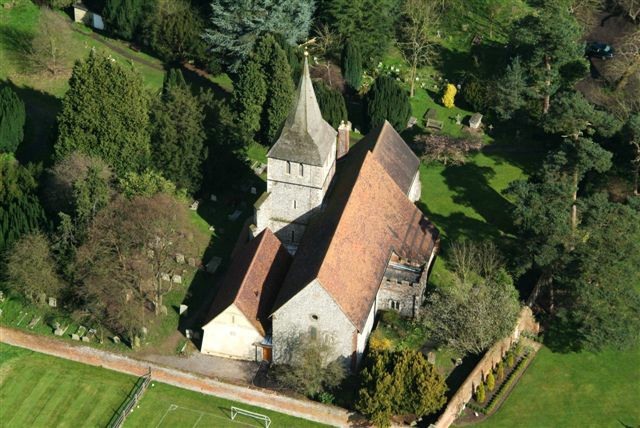 Neither Chelsfield nor Farnborough are recorded as having a church in Domesday times. It is recorded in Bishop Courteneye’s register of 1385 that John de Dountone was Rector of Farnborough only, an occurrence which did not happen again until John Montague was ‘put in [as Rector of Farnborough] by parliament’ during the Commonwealth period in 1650. 1538 saw the introduction of the Parish Register and each Parish had to provide One Book into which all the Baptisms, Marriages and Burials that took place in the Parish were to be entered. The second line states that it was the 80th order issued in the 30th year of the reign of King Henry the VIII in the year of Our Lord, 1538. King Henry’s introduction of Parish Registers caused alarm at first as people thought it was being done to produce a Taxation Register, but it was his son Edward VI who ordered an inventory of the goods in each parish to be made every three years. In 1552, the Churchwardens, John Lambe & John Marshall, ‘of the parishe Church of Farneborowe’ showed to the King's inspectors, one Communion Cup, a Brass Cross, two Copes, two altar frontals, a large Bible and a book of Erasmus. They also showed them three bells in the steeple. The inspectors gave them a clean sheet, certified that they had no ‘Popish’ items in their charge and that they had not illegally disposed of any of the church’s property. The local Rural Dean carries on this type of survey annually to this day. ‘Septembris 18, 1576, Gulielmo Gybbins, sepulto, Rector ecclesiae Chelsfield et Farnborough, cur. Successit Georgeius Smith, Artium Mr. Collegii Alsol. Oxon, socius 300 Aetatis do caturiae natus’. This states, in Latin, that in 1576 William Gibbins, the previous Rector had died and had been succeeded by George Smith, Master of Arts of All Souls, Oxford, aged 30 years. 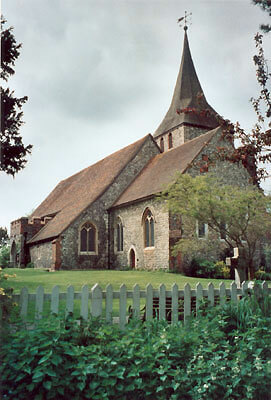 At this time, Farnborough Parish and Chelsfield Parish constituted a Combined Benefice, a long-standing arrangement which continued almost to the end of the 19th century. This meant that the revenues of both parishes were paid to the same priest, who was Rector of both Parishes, each having its own Registers, Churchwardens and Parish Officers. George Smith, named here in the Register, was the first of three generations to be Rector of both parishes, being succeeded by his son, George Smith II, and by his grandson, George Smith III, who died in 1650 during the time of the Commonwealth (1640-1660). On his death, Parliament installed John Montague as Rector of Farnborough and Robert Miller as Rector of Chelsfield. On Charles II’s Accession in 1660, all the Acts of the Commonwealth Parliaments were declared non existent and the two parishes once more became a combined benefice, with its previous patron, and Robert Miller became the Rector of both parishes. As Farnborough was the poorer of the two parishes, the Rectors spent most of their time in Chelsfield, some having left not even a signature in the Parish Registers, the parish work being left to the Curate they had appointed. Thus it reveals that Robert Jegon, who was Curate for many years in the 18th century, recorded in the Parish Register that he had paid the Duty up to date to Thomas Jones, the official collector. This Duty was a Tax which in 1694, was 2 shillings for every birth registered, 4 shillings for each funeral and 2 shillings and 6 pence for each wedding, plus annual tax of 1 shilling on each bachelor and widow living in the parish. The Tax was simplified in 1794, with a charge of 3 pence for every entry in the Church Register. Lord Hardwick’s Act of 1753 saw the introduction of an official book of marriage forms. Farnborough partially complied with the act but the existing Marriage Register was ruled up in the same way as the official forms, and continued to be used. The official book was obtained somewhat later than required. St. Martin of Tours, Chelsfield John Edward Tarleton became Rector in 1834, and in 1840 a tithe survey was carried out. 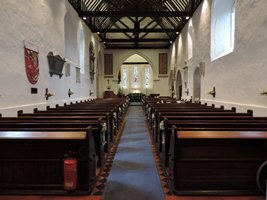 The income from the Tithes amounted to about £30 and the area of the Parish was the same as that given to Dryhtwald in 862 by the King of Wessex. This income was by 1849, when Folliot Baugh became Rector, judged sufficient to support an incumbent, so on his retirement in 1876 the Benefice was divided and each parish has had its own Rector from that date. The building of the South Eastern Railway in 1868 positioned a new 'Chelsfield' station some distance from the village centre. Later in 1926 Orpington bypass opened, causing further fragmentation by separating church from village. In 1938 a further part of the parich of Chelsfield was removed, to become part of the new parish of Green Street Green. Today Chelsfield Parish is less than one third of its original size. The creation of the green belt after the second world war dictated that population growth in Chelsfield was going to be limited for the forseeable future.